Local growers & farmers are welcome to become a vendor by reserving table space for free, PLUS vendors keep 100% of their profit! Food vendors get first priority on available space. Non-food vendors will be worked in if space availability is low. Tables are provided for food vendors only, so non-food vendors will need to bring their own. We hope The Farmacy is a great benefit to the area by providing a resource for fresh locally grown fruits and vegetables, along with various other items. Our many thanks to all the vendors, patrons, and everyone who has been a part of our farm fresh efforts! The Farmacy & Access Family Health Services, Inc. are delighted to be featured in the premier episode of "Spring Stories Series," presented by the Mississippi Primary Health Care Association (MPHCA). Our very special thanks to Andrea Howell, Harold Standifer, & Ray Jones for your time and participation in this video. Qualified patients of Access Family Health may receive one $10 voucher per week per household to go toward certain items* at the farmers market. 1. Patient must be on the sliding fee program (any slide level). 2. Patient must have had an appointment within the last 3 months at any Access clinic. 3. Vouchers are available at the market only (not available at clinics at this time), and must be picked up during market hours above. 4. Patient receives $10 per week only for the duration of the market season (July - October). 5. One voucher covers everyone in the household, even if more than one household member is on sliding fee. 6. Voucher can only be spent on fruits and/or vegetables. Cannot be spent on plants, candies, baked goods, etc. 7. Any amount not spent each week WILL roll over to the next weeks market. 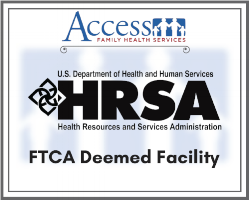 Access Family Health Services through a grant from Catholic Charities (Jackson, MS).